Members of the recently formed Deep Creek Watershed Sign Committee have been busy preparing proposed changes to the watershed zoning ordinance. Members include Jim Lascaris, Julie Mead, Mike Kennedy, Morgan France, Karen Petrie, Rob Michael, Nicole Christian, Karen Myers, Bob Browning, Bill Ingram, and Jonathan Kessler. The idea of amending the chapter began last August when Lascaris voiced his concerns during a Garrett County commissioners’ meeting. He said he had received a letter stating that businesses in the watershed basin were forbidden to fly banners or flags of any type. “Why is there a rule just for Deep Creek Lake and not for the rest of the county?” he asked the commissioners. Commissioner Paul Edwards explained that the watershed is the only zoned area outside of a municipal government’s jurisdiction. Because McHenry is not incorporated, its codes fall under the jurisdiction of the Garrett County Planning Commission. 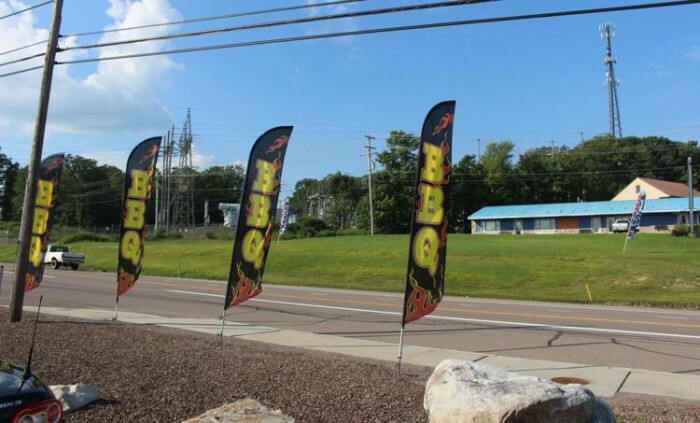 Director Deb Carpenter, Garrett County Department of Planning and Land Development, said the flag/banner/sign issue involved a “broadly written” code that pertains to “anything that attracts attention.” She also noted that violations are complaint-driven. “This year (2018), we got a specific complaint against 12 businesses,” she said during the commissioners’ meeting. After an investigation, Carpenter said, letters were sent stating that owners had five days to remove their flags. Fines would be imposed if they were not taken down. Edwards suggested Lascaris take up the issue with the Planning Commission. Commissioner Jim Hinebaugh asked Carpenter if an extension could be granted to the businesses until the commission has a chance to review the matter further. Businesses “have an opportunity to work with my department to see what they want to petition for,” Carpenter said about possible changes to the zoning ordinance. The commissioners made a motion and unanimously approved a temporary stay in the penalty process. In September, two sign chapter amendments were proposed by local residents. After reviewing the suggestions, however, the Planning Commission decided to revamp the entire chapter. In October, committee volunteers were solicited to help with that process. The committee held its first meeting November 28th. County attorney Mike Getty, Mike Kenney of Kenney Signs, and Carpenter were also in attendance. According to the minutes, the meeting included discussions about the Supreme Court ruling; various types of signage (political, mobile, real estate, feather, etc. ); and interaction with the Planning Commission. Kessler was elected committee chairman/spokesperson and asked to provide monthly updates to the Planning Commission. The sign committee’s December 12th meeting included discussions about identifying and defining commercial and residential zones and identifying sign types for code regulations. The group met again on January 9th and 23rd. Meetings have also been scheduled for February 13th, February 27th, March 13th, and March 27th. The committee members’ goal is to complete their work in time for the Planning Commission’s April 3 meeting. Though not required to do so, the Planning Commission may hold a public hearing on the proposed updated sign chapter before forwarding it on to the county commissioners. The county commissioners, however, are required to hold a public hearing before new language can be added to the watershed ordinance. To obtain more information, visit garrettcounty.org/planning-land-development/deep-creek-watershed-sign-chapter-review. The Planning Commission’s next meeting is set for 1:30 p.m. on February 6th at the courthouse.